Eat the sweet and sour gummies then use the tin as a keepsake or tackle box. A great gift for fishermen of all ages! 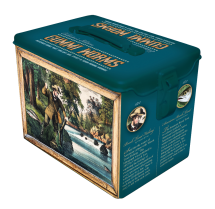 Each tin depicts Currier and Ives classic lithographs of fishing in the early days of history. Tins are lockable, stackable and reusable. Each tin includes two 5oz bags of gummies. 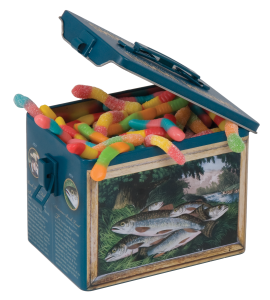 About 73 worms per Tin. 5Lx31/2Wx31/2H inches.